I was recently asked about polish storage for my collection and I've been posting this photo at MUA for at least a year maybe longer so I thought I'd share it here too. I used four Scrapbook drawer cubes made by JetMax and then I went to Home Depot and got the widest shelf they carry and cut it down to about 5 feet. I trimmed the raw edges with white iron on melamine tape and then placed it on top of the cubes. I had planned to silicone it down, but the shelf is so heavy it wasn't necessary. I then lined each drawer with felt, tacking it down with re-positionable glue spray and Viola! Easy peasy and the drawers are the perfect size for all my polish bottles. Each drawer holds about 100 bottles, so I have room to grow about 500 more bottles, YES! I wrote this so long ago, the desk you see above doesn't exist any more. It was filled with four more cubes between those and to their left on the other wall is a whole other set. I also have boxes of polishes that haven't been sorted because I lack the cubes to put them in. I have not ever purged polish in the nearly ten years I've blogged. I think it's about time. 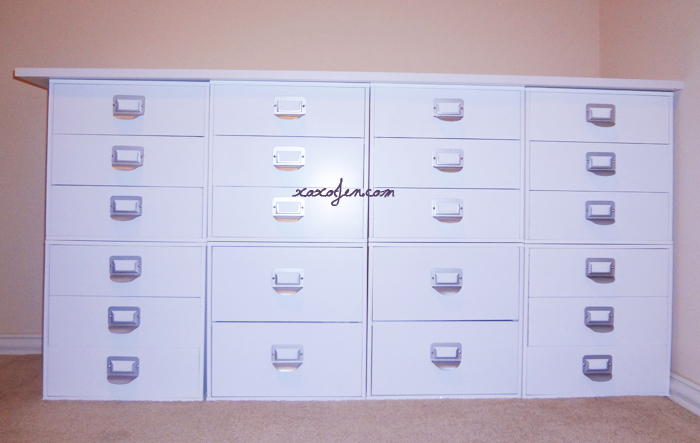 The brand of these drawers changed from Jet Max to Recollections and now is Ashland. I have cubes from both the first two and they have held up well. I have been hearing that their quality has declined though. So if you are on the hunt for these drawers from Michael's, make sure to put them together and check for durability before filling them and deciding to keep them. Oooh, love this. Wish I had the room. Right now, I'm using a 24 pocket over the door shoe organizer. It's actually quite nice because I can sort by color and see all my selections quite nicely. ;) Now the hard part is choosing each time I do a manicure! That sounds handy!! I use a smaller version of that for my perfume oils and love it! I think mine is meant for jewelry. They're pretty great for storing polish! I have since then, added four more cubes so this no longer looks like a desk, but more like a dresser with many drawers! Enjoy your new set up!